American flag artwork flying at KU causes political flap – Welcome to Wyandotte Daily! 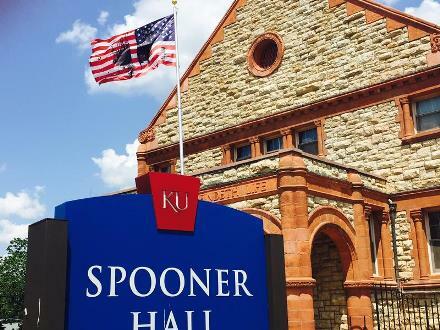 Responding to criticism from elected officials and political candidates, University of Kansas officials have taken down an altered American flag displayed on campus as part of a nationwide art project. KU Chancellor Douglas Girod issued the order late Wednesday after Republican Gov. Jeff Colyer learned of the flag exhibit and demanded its removal. The exhibit is part of a public art project begun last fall called “Pledges of Allegiance.” KU is one of 11 participating institutions at 14 locations across the country. The controversial flag is the creation of German-born artist Josephine Meckseper. It’s overlaid with black shapes that, Meckseper says, represent America’s deep political divisions. State Sen. Marci Francisco, a Democrat whose district includes the university, said she didn’t find the exhibit offensive. “It is clearly identified as art,” she said, gesturing to explanatory plaques positioned at the base of the flagpole. “I think the university has a really strong purpose to allow freedom of discussion, freedom of speech and thought,” she said. Steve Watkins, an Army combat veteran and Republican candidate for Congress in the eastern Kansas district that includes Lawrence and the university, went to campus to see the exhibit for himself and talk to reporters. Calling the altered flag “extremely disrespectful,” Watkins stopped short of demanding removal. Instead, he said he hoped it would serve as a reminder of those who sacrificed to preserve the right to free speech. “All I ask is that they (people who view the exhibit) thank a soldier … for helping create a world that things like this are even possible,” he said.